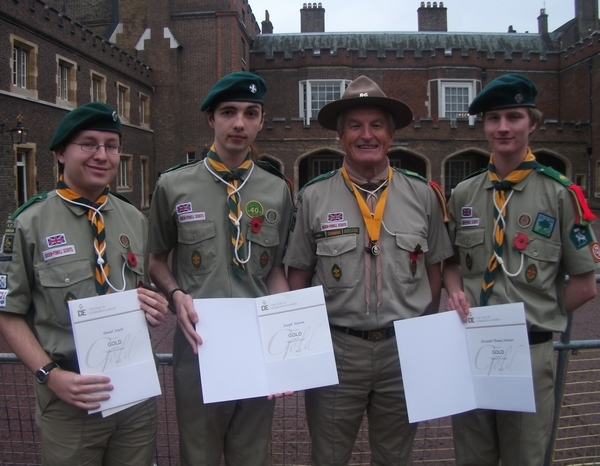 Three Rover Scouts from Earley proudly received their Gold Duke of Edinburgh's Awards at St. James's Palace in the presence of HRH Prince Philip yesterday (8th November 2011). The Scouts (from left to right) Daniel South, Joe Hutton and Alex Stewart, who are all members of 1st Earley Baden-Powell Scout Group, were accompanied by Headquarters Commissioner for Scouts – Jay Dodson. To gain their awards they developed skills in activities like surfing, frisbee and mountaineering, volunteered considerable community service and undertook a leadership training programme. As Daniel told the Prince, they also completed an arduous expedition across the North York Moors for four days, carrying all their equipment and provisions. Joe and Alex travelled back from university to receive their awards. Daniel, recently graduated, is now living and working back in Earley, and is taking on an active role as Assistant Senior Scoutmaster within the Scout Group. Congratulations to them all on this hard earned and well deserved award.